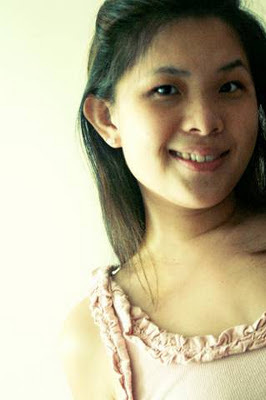 We are so excited to introduce you to our July guest designer, the very talented Emeline Seet from Singapore. She has amazed us with her creativity and lovely style. First we'll let her introduce herself and then show you how she has used our July Kit. My name is Emeline (or Em) and lives in Singapore. Having crafted for more than 8 years, I'm glad I had found my voice in paper crafting. Whether it's dabbling and experimenting with a myriad of mediums from ink, paint, mist etc., the centre and focus of my projects is always about poise, elegance, colors and letting the photos take centre stage thereby recollecting a story. Besides scrapbooking, I love to try my hands on altered art, card making etc. I am thankful for the many opportunities that had turned this hobby into a passion that is close to my heart. Being associated with many top notch manufacturers in the industry is indeed an eye opening experience. Designing and promoting for manufacturers is one aspect in paper crafting. I am delighted to learn and experience another aspect of conducting workshops in Singapore, Malaysia, Indonesia, Brunei in sharing and spreading the love of this craft. bI conduct regular workshops as an instructor/designer at my local store (Papermarket, Singapore). If my journey with this craft is described as eating different ice cream flavors, then, getting to see my own projects in print on several international magazines would be described as putting the cherry on top. Indeed, I have grown and learned a lot through this life-long hobby. Currently, I am designing for Melissa Frances, Webster's Pages, Inkido and Scrap 365 UK Magazine. I am intrigued by the fabulous color combination in this month's kit. Cream, black and a splash of red and dusty orange works perfectly with one another! Here on my layout, I mixed the pattern papers and cut out motifs to complement and complete the look on this page. I added the black alphabet stickers and wanted it to deliberately blend against the black pattern paper. It is subtle and I love how it turned out. commemorate and complement the wedding theme. I must say, the highlight of this layout will have to be the arm chair die cut. I've always loved arm chair motifs this cut out of the element is so pretty and in my favourite color , cream! This picture is perfect, with my daughter lying on our own arm chair at home. Other Items Used (not in kit): White eyelet, white paint, Martha Stewart Paper Punch. The picture was taken on my daughter's 9th birthday. It's a tradition (like many parents) to take a picture every year and I used a pastel combination to remember this milestone. The die cuts on the add-on kit is so versatile and can be easily used as a platform to layer. Alternatively, I used the die cut with a foam dot for instant dimension. Other Items Used (not in kit): Doily, Stickles, white paint, Martha Stewart Paper Punch. Emeline, it has been such a joy to have you create with our July Kit! Thank-you SO much for being our guest this month, Emeline~!! Such incredible work! !